The double closet doors stand open, hangers displaying a variety of appealing colors, textures and styles of footwear, shirts and cardigans. The bureau drawers are open, too, showing pants of many colors. Which will be chosen for the upcoming author event for which I am the main attraction? I must choose soon. It’s nearing show time. I’ve already rehearsed bits of my spiel in the mirror. Gone through what I will say, what feelings I will project for the hordes of adoring fans (if only!) that will attend to my every word and gesture. Why do I get the feeling that this bookish outing in which I surely will be judged, is eerily like competing in a horse show? Like riding in the spotlight, trying to stand out from the herd of other contenders, trying to look happily competent and sure of winning while my gizzards flip like a landed trout? I’ve already flailed away at the mirror. Fluffed recalcitrant locks. Blushed my cheeks. Filled in eyebrows, eyelashes and eyelids with a dizzying array of crayons and potions. Applied with a discerning hand, of course. At my age (72) I don’t want to resemble a lavishly tended grave! This outfit is tried and discarded. Then that one — “too dressy,” “too warm,” “too tight” (I’m cutting back on Cheezits tomorrow). I choose one, appropriately feminine and Western. Yes, that’s the look I want today. Then I hold out a book. I say a few words about it, trying to look as if I think this is the greatest thing since sliced bread. Cubed hay? 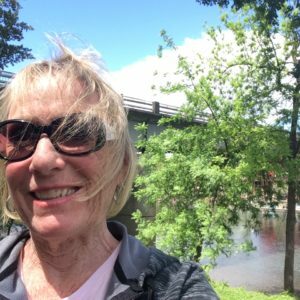 On the road again, driving to the bookstore (or library, reading group, literary festival), it feels as if I am warming up. I again practice saying my main points, running through the coming gig mentally, visualizing perfection. 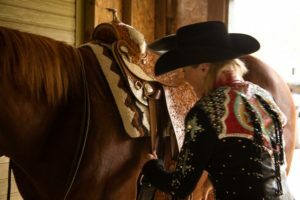 That, too, is what I did those wonderful years showing my horses in various events — Western pleasure, horsemanship, trail, hunt seat and showmanship. A confident calm settles over me. I really am ready. The bookstore looms ahead. The “arena” where the magic happens. I park, bring my gear inside, set up at the table, adjust the microphone. Listeners trickle in. A tingle riffles through me. I review my points. A hint of stage fright — just enough to put me on point, with all my prep set to peak at the right time. Breathe, breathe. Cue energy. Do it like you did at home. Only better. 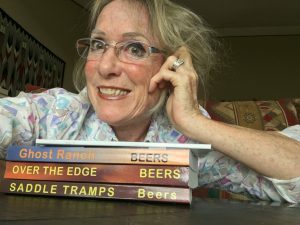 “Hello, it’s great to see you here today,” I begin, making eye contact with the two or twenty that have set aside part of their day to see me and hear about my books. “I hope you’re ready for a good ride — or, read — with my amateur cowgirl-sleuth in the modern West.” Or words to that effect. Keep it natural, make it easy for “judges” to like you and your books. Win that class! I loved showing horses. A bit of a wreck beforehand, a bit overwhelmed by all the elements that went into preparing for those few minutes on the spotlight. Obsessed with this or that detail of outfit or presentation. Afraid of bombing, of going over like a dead horse. But you know? 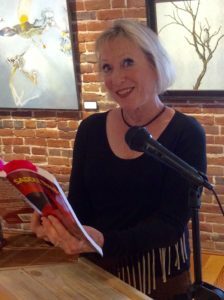 Once underway with people watching, judging, responding, I come out a winner no matter how many judges like me, how many ask great questions, how many listeners buy my books. Really. It all depends on how you define winning. And believe me, I have a very broad definition of it! Pardon me, but do you read cows? You heard right. Or, herd right. I am mesmerized watching them, in pasture. I feel at peace, and become lost — and found — in their world. It’s almost like watching the ocean. Or reading an absorbing book. What’s your favorite breed or genre? 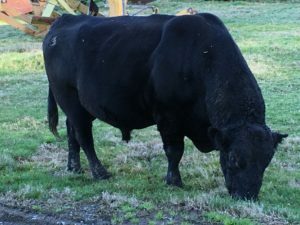 For me, it’s big, blocky, ink-black Angus, though I love all breeds. But sometimes I like frisky ones or those determined to return to their herd after being cut out by dogs and horsemen. Again, I am reminded that cows, calves, steers, and heifers are in odd but important ways, a bit like books. And that’s no bull. You learn things, feel things, see through different eyes, reading both. I gravitate toward the beef breeds — big, languid calves and adults who know their place on the land and with their peers. Like all cattle, they regard the world and its mysteries with large, curious eyes. They play and react rightly to needs, threats or attractions. Perhaps seek food or their calf. Reassure a herdmate, drive off interlopers, find shelter together. And often they just hunker down and chew things over. So, too, with unpretentious yet powerful books. I like a book that’s confident of its place, nature and purpose — which may or may not, in time, include obscurity. For example, plain-speaking books that nonetheless move with a certain grace and at an appropriate pace. They can race occasionally. They can buck, twist, veer from their herd. Or merely ramble here and there, searching out a hidden tidbit. Let me offer examples of what I mean. “To Kill a Mockingbird,” for one. It is told truthfully yet simply from an educated Southern family’s viewpoint as life unfolds, halts, runs, turns and hesitates at the threshold of catastrophe. Even tips over into that, as we read, spellbound. Unable to look away, though the book moves along with no more exertion than necessary. Other examples of books behaving naturally and honestly, true to type yet with their own brands, quirks and earmarks, are works by: Joan Didion, Craig Johnson, Catherine Ryan Hyde, Robert B. Parker, John Steinbeck, Molly Gloss, Ernest Hemingway, Will Rogers, and (insert your favorite) here. Now watching friskier or prettier critters — like reading relentlessly zippier books — can be quite a delight. Even addicting. Let’s change it up, put pep in our perusals. Let’s grab this new Janet Evanovitch or that Lee Child. Venture into that mid-list author who’s charging strong! But as a general practice, day in, day out, I am most at ease with books that are more like cows: Tomes that have natural lingo, reasonable pace and occasional bright, scary or funny situations, rather than the noisy, showy faster-moving ones. Life is cabaret enough, war-zone enough, Saturday-night-fever enough. I don’t shrink from such places or people. I seek truth with entertainment, after all. So I welcome the occasional thriller, chiller or romance all tarted up with hypercharged language and constantly shifting scenes. I just don’t seek them as my main fare. 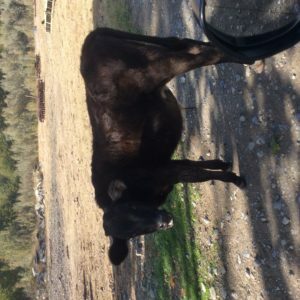 For that, and for heartfillng peace and long-haul sustenance, I need my cows! I am “Over the Edge” with excitement today. 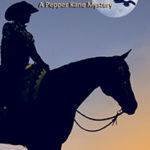 The second book in my Pepper Kane mystery series, warmed by the hands of early readers, has at last hit online sites and select bookstore shelves. It’s about time. The conception was rip-roaring fun, as conceptions often are *blush*. The ten-month gestation, not so much — although there were many high points in the creation that really rocked. The book began life as a novella. 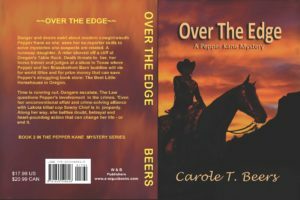 A short, sweet sumpin’ designed to bridge the gap between “Saddle Tramps,” the first Pepper Kane contemporary-cowgirl mystery, and its sequel flickering on the far horizon. 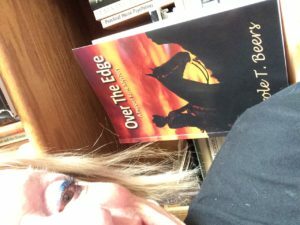 I wrote a draft of this “shortie.” Had my amateur sleuth in present tense (both meanings) riding to the edge of Oregon’s Table Rock, where she rushed to stop another rider from falling off a cliff. Seemed a good idea at the time. Didn’t it? What part of “no” didn’t I understand? Something did feel off. And my writers critique group howled with dissatisfaction. Back to the writing board. 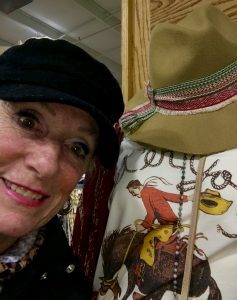 Then my mentor Stella Cameron, a NYT and USA Today bestselling author, advised I write a full-length “Saddle Tramps” sequel book IMMEDIATELY. Which in writer’s lingo means six to eight months after the first. At most, a year. Or readers will forget you, she said, and move on. Stella writes her brilliant English village mysteries in six months! Many bestselling authors write that fast. Thus began the book that became the “Over the Edge” you see today. 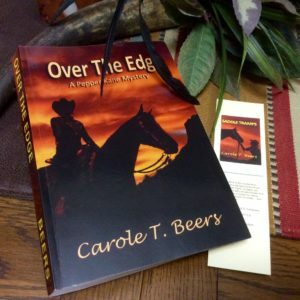 Incorporating parts of the rough novella, I crafted a more complicated plot with a larger, more diverse cast of characters, and then hauled them all off to Texas for a world-championship horse show. 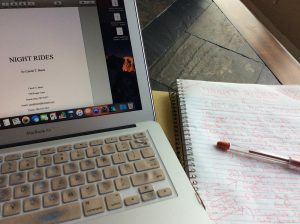 Of course the book took WAY longer than I thought to write, revise and pull together. And buckets more blood, sweat and tears. For me AND my editor. Don’t they always? Even the cover gave me a few fits. But now it’s out. At last. I can breathe. And best of all? I really love this little bugger. If you can call 340 pages “little.” If you call weighing over a pound, “Little.” I am proud as punch. Can punch be proud? Here. Have a cigar. Oh, and a pretty balloon. Many of you cheered and supported me in creating this novel. So thank you for that. Here. Hold the baby. Give it a good long look. I hope you love it as much as I do. Then, when done, will you kindly leave a review on Amazon and Goodreads? Thanks, everyone. We’re all in this together — a family for the books!